The Handmaid’s Tale is a dystopian-style cautionary tale set in a radically theocratic America. The Christian fundamentalist regime, called “Gilead,” has divided women based on fertility and obedience. Handmaids are fertile women who serve as surrogate wombs for the Commanders and their aging wives. All women are completely stripped of their rights—everything from reading to purchasing power—and are sorted into classes to divide and control them. The Wives—women married to the powerful Commanders—are relegated to spending their days knitting, gardening, and waiting for their Handmaid to give birth to a child. Handmaids are completely powerless, and everywhere they go, there are Eyes—the military division of the Gilead regime—watching and waiting to kill them for any misbehavior. 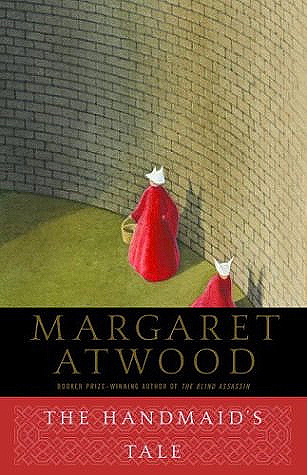 One reviewer on The Verge called the story, “1984 for feminists… but a lot scarier.” This theocratic society has based its revolution on a Bible passage in the book of Genesis about Jacob’s wife, Rachel, allowing her handmaid to conceive Jacob’s child on her behalf. This passage is recited during the monthly ceremony in which the Commander attempts to impregnate the Handmaid, all under the Wife’s watchful eye. If a Handmaid cannot reproduce, she is sent to labor internment camps with the Unwomen—old and infertile women who are no longer valuable to the society. Handmaids are containers for babies, and nothing more.